No problem. I went to Minneapolis in my '97 F150 3 years ago to get my '13...handled it like a champ. Just went to the same area this year in my "new" '16 F150,for a '12 touring, same thing. Even with 40 mph winds on the way home on the beam...no problem. Just make sure you get one of those friction anti-sway bars for it. They're around $40 worth every penny. Get the 20 ft trailer. You can never have too much trailer. Wiggle room is very nice. I use my "extra" space for a good permanent tool chest with vise, spare parts, winch (you never know when the T will have trouble), folding chairs for that quiet after tour time, etc. The F-150 will handle it well IF you have the V-8 engine. 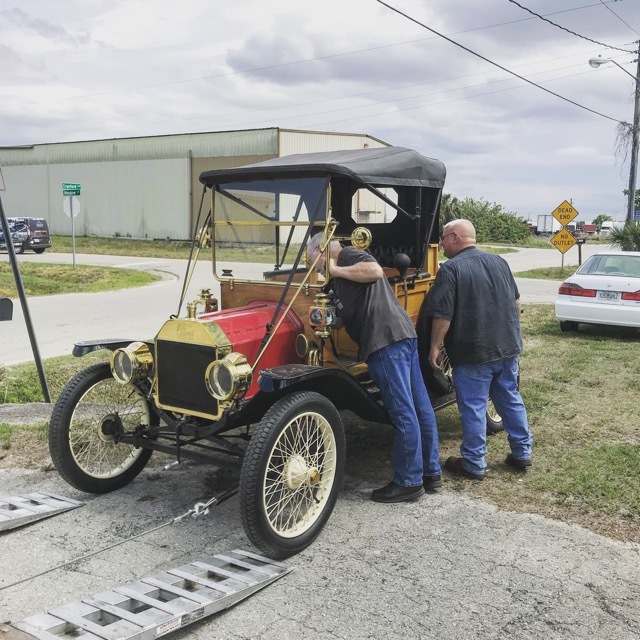 However, I pull a 1912 touring with an F-250, just that much more secure and stable on the road due to the extra towing capacity. I really doubt you will be happy with a 16ft. We had a 20ft for a while and when that one was wrecked went to a 24ft. You can't really haul any extras that short. At least with 20ft you can put some other cars in it. I just took delivery of a new trailer for the Model T and it can double nicely for snowmobiles as well. I ordered the 7.5' model. Leaves plenty of room for me to negotiate my girth around the car. Don't know if you have a V-front or not, but its the size of the "box" not necessarily the over-all length that really determines how much useful space you have inside to park your car. Mine is 18". Over-all length of trailer 22'. By the way, my tow vehicle is 2016 F150/ 3.5L ecoboost. Handles the job with ease. I an surprised that you can get away without a weight distributing hitch with that setup. On my 2011 F150, the towing guide specifies that anything with a tongue weight over 500lbs requires it. I think they�re a good idea either way. Done that already many times over the years. Now I am offering my assistance to folks who are ready to buy a new trailer. Dan B...you're correct about the weight dist. hitch. I failed to mention that in my post. I use that AND the friction sway control. I think having both those apparatus' definitely helped bringing home my '12 in 40 mph cross winds! I use both the weight distribution hitch and friction anti-sway control. They make a big difference when passing semis on the highway in windy IL. Our 8'6" x 18' haulmark is 20 years old and if i buy again it would be nice to know who will build custom features?Bud. 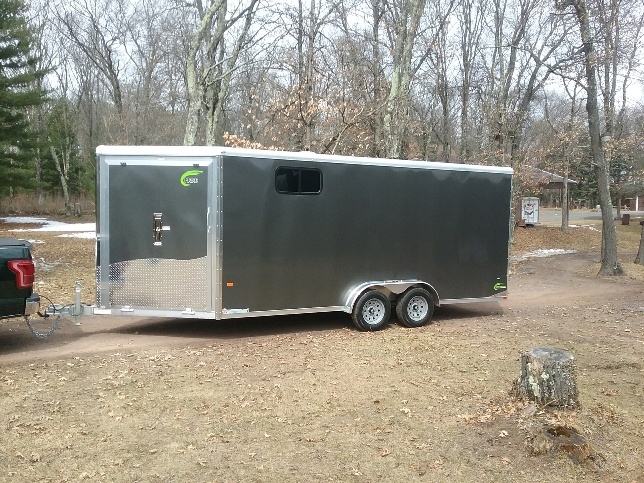 I had a 24' trailer for almost 30 years and bought it with the idea of being able to take two cars. In 30 years I think I did that twice so the rest of the time I dragged a lot more trailer than I needed everywhere. I now have a 16' trailer which is plenty big enough for a T and the 8.5 width makes it easy to get around. I can even get my big 7 passenger Chalmers touring car in the trailer ( with the top flipped forward ). With a T in there you barely know you're pulling a trailer. If we ever get another it will be 8'6" X 20' and have a pair of 30" french doors ahead of the axels.The large side door option would let me load a pallet or two with a fork lift.Bud. I have a 16 footer and couldn't be happier with it. Plenty of room for the T and a whole pile of junk. When we moved to Florida from Massachusetts I took the T as well as the stuff that the moving company wouldn't haul (gas cans, aerosol paint, oil based paint, booze, firearms, etc). I even put a spare set of T wheels and the spare to my truck in there. The only stuff that was in the T itself was a box of ammo and two American flags. I would say that if you are even thinking of owning something significantly bigger then a T I would go for an 18 or 20 footer. P.S. - Nice trailer Kevin! Harold, I'm on my second enclosed car trailer with a V nose. Mine has a 3' V nose and a 5' tongue, and there's plenty of room for my weight distributing hitch. You just have to specify all your needs and measurements when ordering the trailer. If you don't properly specify what you need you might wind up with a V nose on a short tongue that won't work with a weight distributing hitch. Buyer beware and specify what you need.